The Greens Farms Academy boys’ squash team finished third at the U.S. National High School Squash Division V tournament in Philadelphia last weekend. The Dragons posted a 3-1 record, capping its third-place finish by notching a 4-3 win over New Canaan. Jack Soper and Giani Panariello earned 3-0 wins in their respective matches at No. 2 and No. 7, singles respectively, by John Selkowitz and Will Mackle took 3-1 victories at slots three and five. The Dragons were close to making the championship match but fell to Tower Hill of Delaware in the semifinals, 4-3. Selkowitz, Mackle, and Panariello each earned victories for the Dragons. Selkowitz won 12-14, 9-11, 11-7, 11-6, 11-8; Mackle won 11-8, 11-13, 7-11, 14-12, 11-9; and Panariello took a 9-11, 8-11, 11-5, 11-7, 11-5 win. Duda Voldman took a game out of the No. 1 slot while Soper was pushed to five games but fell 11-9 in the decider. Earlier in the day, GFA defeated St. Paul's of Maryland by a 4-3 score in the quarterfinals. 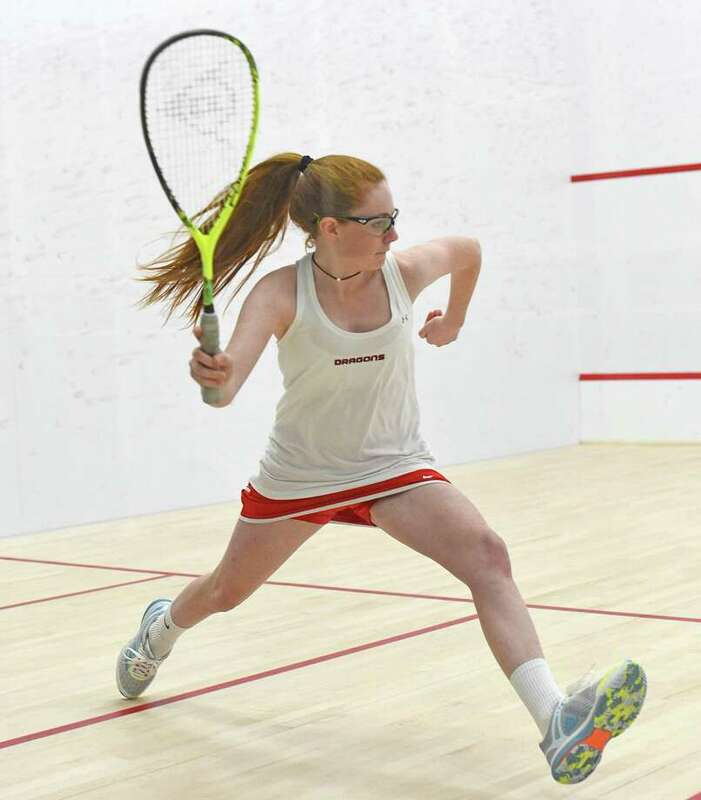 The Dragons finished seventh out of eight teams at the US National High School Squash Division V championship tournament. Friends Central pulled out a 7-0 win in the opening round, but that doesn’t tell the whole story. Again, playing without two of their top players, the Dragons battled. Fairfield’s Annabelle Kreitler was edged in a heartbreaker at No. 6, falling by an 8-11, 11-9, 11-7, 12-14, 15-13 score. Lucy Nelson, playing at No. 4, took a game off her opponent in an 11-8, 4-11, 11-6, 11-7 defeat. Fairfield’s Greg Lawrence had 20-20 vision on Wednesday, scoring 20 points and grabbing 20 rebounds to lead GFA to a 65-48 win over the Brunswick School. Fairfield’s Cole Prowitt-Smith added 18 points and Henry Holzinger chipped in with 13 to pace the GFA effort. GFA put together one of its best overall efforts of the season in a 58-32 win over Christian Heritage. The Dragons raced out to a 34-17 halftime lead and never looked back to improve to 7-9 on the season. Katherine Marcus scored 23 points to lead the effort while Georgie Grabowski tallied 10 points. Kelly van Hoesen added seven more. Elyse Kimball had five points.